Objectives: To test if arterial spin labeling (ASL) MRI could detect a pattern of hypoperfusion in frontotemporal dementia (FTD) vs cognitively normal (CN) control subjects; to determine the regional difference of perfusion between FTD and Alzheimer disease (AD); and to determine whether hypoperfusion in FTD correlates with cognitive impairment. Methods: We included 21 patients with FTD, 24 patients with AD, and 25 CN subjects in this cross-sectional MRI study. All subjects had MRI scans including T1-weighted structural images and ASL-MR images. Results: ASL-MRI detected a pattern of hypoperfusion in right frontal regions in patients with FTD vs CN subjects, similar to PET and SPECT. FTD had higher perfusion than AD in the parietal regions and posterior cingulate. Frontal hypoperfusion in FTD correlated with deficits in judgment and problem solving. Adding frontal perfusion to gray matter (GM) atrophy significantly improved the classification of FTD from normal aging to 74%, and adding parietal perfusion to GM atrophy significantly improved the classification of FTD from AD to 75%. Combining frontal and parietal lobe perfusion further improved the classification of FTD from AD to 87%. Conclusion: Frontotemporal dementia and Alzheimer disease display different spatial distributions of hypoperfusion on arterial spin labeling MRI. With further development and evaluation, arterial spin labeling MRI could contribute to the differential diagnosis between frontotemporal dementia and Alzheimer disease. Frontotemporal dementia (FTD) and Alzheimer disease (AD) can be difficult to clinically differentiate because of overlapping symptoms.1–3 Structural MRI can assess regional patterns of brain pathology and may aid a differential diagnosis between FTD and AD.4–10 However, overlapping of brain tissue loss limits structural MRI to achieve complete separation between FTD and AD. Functional neuroimaging, yielding complementary information to tissue loss, may help the differentiation between FTD and AD. Previous PET and SPECT studies have shown different patterns of metabolism and perfusion reduction in FTD and AD.11–26 However, PET and SPECT have several disadvantages, including injection of radioactive tracers and limited availability in comparison with MRI scanners. Arterial spin labeled perfusion MRI (ASL-MRI) is another method to assess brain perfusion.27 Previous studies found that ASL-MRI detects a regional pattern of hypoperfusion in AD,28,29 similar to PET and SPECT. Therefore, we tested if ASL-MRI detects a regional pattern of hypoperfusion in FTD vs cognitively normal (CN) subjects and patients with AD, similar to PET and SPECT. A complication in interpreting functional imaging data is that brain atrophy and partial volume effects (PVEs) can mimic metabolic and perfusion reductions. Therefore, we also sought to determine if the patterns of hypoperfusion in FTD remain after accounting for PVE. Last, we explored if ASL-MRI can depict the severity of FTD and if PVE-corrected perfusion can improve the separation of FTD from CN and AD over that using structural MRI alone. We included 21 patients with FTD, 24 patients with AD, and 25 CN subjects in this cross-sectional MRI study (table 1). We recruited the patients with FTD and AD from the Memory and Aging Center of the University of California, San Francisco. All patients were diagnosed based upon information obtained from an extensive clinical history and physical examination. MRI data were used to rule out other major neuropathologies such as tumor, stroke, severe white matter disease, or inflammation but not for diagnosis of dementia. Inclusion criteria were age between 35 and 80 years and no history of brain trauma, brain tumor, stroke, epilepsy, alcoholism, psychiatric illness, or systemic disease that affects brain function. FTD was diagnosed according to established consensus criteria.1 Patients with FTD, who had motor neuron disease–related symptoms, were excluded. Patients with AD were diagnosed according to the criteria of the National Institute of Neurological and Communication Disorders and Stroke/Alzheimer’s Disease and Related Disorders Association.2 All subjects received a standard battery of neuropsychological tests, as described before.30 This included assessment of global cognitive impairment by Mini-Mental State Examination (MMSE)31 and global functional impairment by Clinical Dementia Rating (CDR) Scale.32 In addition, we administered the California Verbal Learning Test (CVLT)–Short Form to assess episodic memory and a modified version of the Trail-Making Test (TMT) to evaluate executive function.30 All subjects or their guardians gave written informed consent before participating in the study, which was approved by the Committees of Human Research at the University of California at San Francisco. All images were processed step by step using the protocol described previously,28 with Statistical Parametric Mapping version 2 (SPM2) (Wellcome Department of Imaging Neuroscience, London, UK). First, labeled and unlabeled perfusion images were coregistered to the reference EPI, which in turn was coregistered to the T1-weighted images using the mutual information coregistration algorithm within SPM2. After image coregistration, a perfusion image was calculated by subtracting labeled from unlabeled ASL-MR images. Perfusion intensity was then adjusted for instrumental variability by correcting for receiver gain and coil loading. To obtain perfusion of gray matter (GM), the T1-weighted image was segmented into GM, white matter (WM), and CSF using a custom template that was created by averaging the spatially normalized T1-weighted images of all subjects in the study, which provides an a priori tissue map. The GM probability map was then blurred to the spatial resolution of perfusion MRI and thresholded at 20% probability. This minimized misregistration between perfusion and T1-weighted MR images and further excluded noise from regions of WM and CSF. To account for partial inclusion of WM when GM probability was less than 1, ASL-MRI intensities were corrected according to the following: I corr = I uncorr/(GM + 0.4*WM), where I corr and I uncorr are the corrected and uncorrected intensities, and GM and WM are the tissue probabilities. Here, we assumed that perfusion of WM is globally 40% of that of GM based on previous PET study.35 Finally, the GM perfusion images without and with PVE correction were spatially normalized to the custom template.36 To estimate regional brain atrophy, GM images were spatially normalized to the customized template with a modulation method.37 This involves multiplying voxel values in the segmented images by the Jacobian determinant of the nonlinear transformations to preserve GM volume in regions of expansion or contraction. 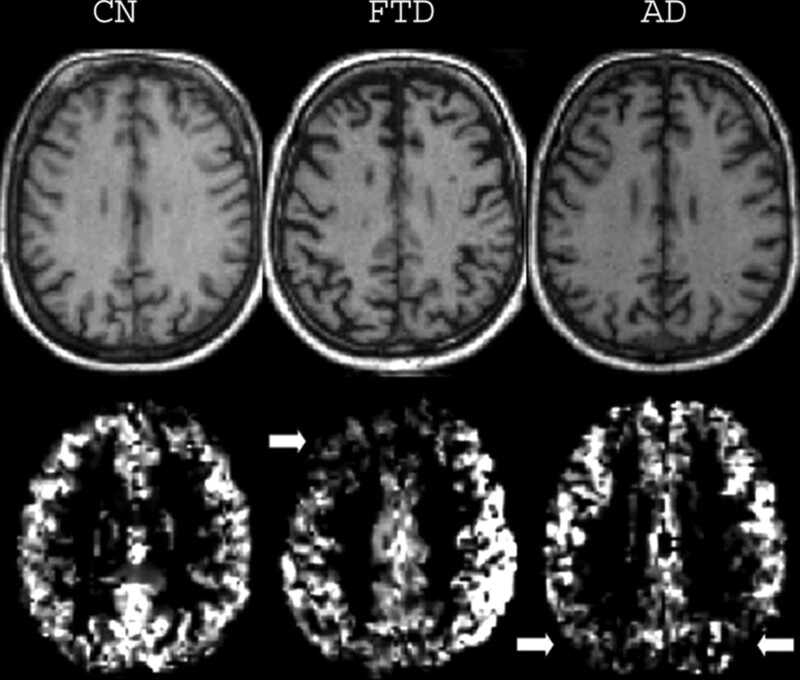 Figure 1 shows representative perfusion images of individuals with CN, FTD, or AD after correction for PVE. Figure 1. Representative structural and arterial spin labeling MR perfusion images after partial volume corrections from a cognitive normal (CN) individual, a patient with frontotemporal dementia (FTD), and a patient with Alzheimer disease (AD). Notes diminished perfusion in frontal brain regions (arrow) in the patient with FTD and posterior brain regions (arrows) in the patient with AD vs the CN subject. We restricted tests of correlations between hypoperfusion and cognitive impairment to brain regions in which SPM revealed significant hypoperfusion in FTD compared with CN. Furthermore, we based group classifications by ASL-MRI and structural MRI on measurements of mean perfusion and mean GM mass in predetermined frontal and parietal lobe GM regions of interest (ROIs) covered by ASL-MRI. As previous PET and SPECT studies showed significant perfusion reductions in frontal lobe in FTD16–23 and in parietal lobe in AD,38,39 frontal and parietal lobes were chosen for the classification. ROIs were selected by transforming the labels for frontal and parietal cortex from an anatomically parcellated brain template (available in MarsBarR; http://marsbar.sourceforge.net/) to our population template. Mean values of perfusion and GM mass were then obtained separately for frontal and parietal cortex regions in each subject by averaging across the ROIs. Statistical tests were performed within the framework of SPM2. Images were smoothed with a 12-mm full width at half-maximum Gaussian kernel prior to statistical analysis. Group comparisons were performed voxel by voxel by analysis of covariance, where age and perfusion of the motor cortex were included as confounds in the model to account for effects related to age and global variations of perfusion between subjects. Thresholded p value was set at an uncorrected voxel-level p value of <0.001, and the cluster size was thresholded at 200 voxels in these analyses. Statistics are reported as cluster-level-corrected p values (p > 0.05). To test if hypoperfusion in FTD correlated with cognitive impairment, a general linear model was used with age as covariate. Group classification based on ASL-MRI and structural MRI was tested using a logistic regression. Furthermore, sensitivity and specificity of the classifications were expressed in terms of a receiver operator characteristics analysis. Table 1 lists the demographics and clinical data of the subjects. The groups did not differ by age (p > 0.4). The percentage of women in the FTD group was less than in the CN group (χ2 = 5.1, p = 0.02), but similar to that in the AD group (χ2 = 0.5, p = 0.4). As expected, patients with FTD and AD scored lower than CN subjects on all cognitive tasks (p < 0.01). Patients with FTD scored better on the MMSE tests (p < 0.05) but marginally worse on the CDR (p = 0.07) in comparison with patients with AD. With regard to specific cognitive functions, patients with FTD scored better on verbal memory (number of words recalled from a list of nine words) (p < 0.01) assessed by CVLT and executive functions (number of correct line drawings per minute) assessed by TMT (p < 0.05) in comparison with patients with AD. Figure 2 depicts regional hypoperfusion in FTD compared with CN without (figure 2A) and with (figure 2B) PVE correction. Clusters of hypoperfusion are superimposed on a template brain. The shaded areas indicate brain regions that were not covered by ASL-MRI. FTD was associated with hypoperfusion bilaterally in the middle frontal cortex and the right superior frontal cortex. After PVE correction, hypoperfusion remained significant for FTD in the right superior and middle frontal cortex, whereas hypoperfusion in left middle frontal cortex disappeared. A summary of the SPM analysis is listed in table 2. Figure 2. Regional hypoperfusion in patients with frontotemporal dementia vs healthy control subjects before (A) and after (B) correction for partial volume effects. The intensities of color coding in these renderings (including figures 2 and 3) are a weighted sum of t values, where the weights are proportional to the depth within the brain; that is, deeper regions will be shown with less intensities. Figure 3 depicts regional differences of perfusion between FTD and AD without (figure 3A) and with (figure 3B) PVE correction, similar to figure 2. Compared with AD, FTD was associated with higher perfusion bilaterally in inferior parietal cortex, precuneus, and posterior cingulate, irrespective of PVE correction. A summary of the SPM analysis is listed in table 2. To further investigate the extent to which differences in dementia severity between the two patient groups biased perfusion differences, we included MMSE and CDR scores as confounds in an SPM analysis. The findings of higher perfusion in left inferior parietal cortex and bilaterally in the precuneus and posterior cingulate in FTD compared with AD remained, though cluster size slightly decreased as is depicted in figure 3C. In contrast, higher perfusion in the right inferior parietal cortex in FTD compared with AD disappeared. Furthermore, no region was found where FTD was associated with lower perfusion values than in AD, regardless of PVE corrections. To determine the extent to which the results depended on the probability threshold for GM map, an analysis without a threshold was performed. Analysis with and without the threshold yielded the same regions of perfusion differences between the groups, although cluster size was on average slightly smaller without threshold values. Figure 3. Regional hyperperfusion in frontotemporal dementia (FTD) vs Alzheimer disease (AD) before (A) and after (B) correction for partial volume effects. (C) Regional hyperperfusion in FTD compared with AD after accounting for variations in dementia severity as measured using Mini-Mental State Examination scores and Clinical Dementia Rating box scores. Correlations between perfusion and cognitive impairments. To determine whether decreased perfusion in FTD was related to cognitive impairment, we correlated mean perfusion in the clusters where FTD had significantly decreased perfusion when compared with CN with different cognitive measurements, including MMSE, CDR sum of the box and CDR subscores, CVLT, and TMT scores. No relationship between hypoperfusion and MMSE, CVLT, or TMT was detected. On the CDR, hypoperfusion correlated (r = −0.45, p < 0.05) only with increased impairments in judgment and problem solving. As the most significant differences between FTD and CN occurred in frontal brain regions, frontal lobe perfusion and GM mass measures were used to compare the powers of ASL-MRI and structural MRI to discriminate between FTD and CN. Frontal GM mass in regions covered by ASL-MRI did not discriminate between FTD and CN in a logistic regression (p > 0.3). In contrast, including frontal GM perfusion achieved a separation between FTD and CN (p < 0.01), yielding a 74% correct classification with a 71% sensitivity, a 76% specificity, and an area under the curve (AUC) of 0.80. As the most significant differences between FTD and AD occurred in parietal brain regions, parietal lobe perfusion and GM mass measures were used to compare the powers of ASL-MRI and structural MRI to discriminate between FTD and AD. Parietal GM mass in the regions covered by ASL-MRI achieved a separation of FTD from AD (p < 0.01), yielding a 67% correct classification with a 67% sensitivity, a 67% specificity, and an AUC of 0.80. Including parietal perfusion further improved the classification (p < 0.05), resulting in a 75% correct classification with a 67% sensitivity, a 79% specificity, and an AUC of 0.85. The discrimination between FTD and AD further improved when proportionate changes of perfusion and structural changes in the posterior brain were related to those in the frontal brain by defining frontal-to-posterior gradients of GM mass or perfusion. Using the gradient of frontal–parietal GM mass (frontal GM mass – parietal GM mass) for separating FTD from AD yielded overall an 80% classification (p < 0.01) with an 81% sensitivity, a 79% specificity, and an AUC of 0.88. Adding the gradient of frontal–parietal perfusion (frontal GM perfusion – parietal GM perfusion) to the analysis improved (p < 0.05) the classification between FTD and AD from 80 to 87% with a 90% sensitivity, a 83% specificity, and an AUC of 0.94. The major findings of this study were as follows: 1) ASL-MRI detected regional hypoperfusion in the frontal cortex in FTD vs CN while parietal and occipital brain regions remained spared. The results are consistent with previous PET and SPECT studies of functional abnormalities in FTD. 2) ASL-MRI found higher perfusion in parietal brain region in FTD when compared with AD, in agreement with the primary distributions of FTD and AD pathologies. Furthermore, perfusion abnormalities in FTD were not explained by underlying structural variations. 3) Reduced perfusion in frontal cortex in FTD correlated with cognitive impairment (judgment and problem solving), implying that ASL-MRI measurement reflects FTD severity. 4) ASL-MRI improved classification of FTD from normal aging and AD over that from structural MRI, suggesting that ASL-MRI has potential to aid in diagnosis of FTD. The finding of perfusion reductions in frontal brain regions in FTD with sparing of posterior brain regions is congruent with many PET and SPECT studies.12,16–23 However, previous functional studies did not account for PVE, and therefore structural differences between FTD and CN may have biased previous findings.12,16–23 When accounting for structural variations, our findings indicate that perfusion reductions in the right superior and middle frontal cortex in FTD are independent of structural variations, whereas perfusion reductions in the left middle frontal cortex in FTD disappeared after PVE correction. It remains to be seen if right superior and middle frontal cortices are more vulnerable to FTD pathology than other brain regions because several other PET studies found either no lateralization23 or hypometabolism predominantly in the left hemisphere.16 Nevertheless, the results demonstrate the importance of accounting for PVEs when interpreting functional imaging data. The other major finding that FTD was associated with markedly higher perfusion in left inferior parietal cortex and bilateral precuneus and posterior cingulate than AD is also consistent with previous PET and SPECT studies that directly compared FTD and AD.24–26 In contrast, we did not find brain regions in FTD that had lower perfusion than in AD, even after PVE correction. There could be several reasons for the discrepancy between this study and previous studies.24–26 First, the previous PET studies involved patients with FTD and AD, who were more demented according to MMSE scores than the patients in our study.25,26 Therefore, it is possible that the magnitude of hypoperfusion in FTD reaches the levels of hypoperfusion in AD only in advanced stages of the disease. Second, dementia severity of patients with FTD and AD was matched based on MMSE scores in previous studies,25,26 whereas in this study we attempted to match both MMSE and CDR. A previous neuropsychological study from our group suggests that when MMSE scores are used exclusively to match patients with FTD and AD, patients with FTD have more impairment in judgment and problem solving, which is associated with frontal regions.30 This may explain why lower perfusion in frontal regions in FTD compared with AD was found in previous studies.25,26 Third, previous PET studies that compared FTD with AD did not account for PVEs.12,24–26 A systematic difference between FTD and AD in frontal lobe brain structures as reported5 may therefore explain the functional differences in previous studies. Our finding that reduced perfusion in frontal cortex in FTD correlated with diminished judgment and problem-solving abilities. Although the patterns of reduced blood flow in frontal brain regions may reflect selective recruitment of patients with FTD with behavioral disturbances, the correlation of reduced perfusion in frontal lobe with diminished judgment and problem-solving abilities actually supports the ASL-MRI findings in FTD. Last, we found that measurement of frontal perfusion improved the classification of FTD from normal aging, and measurement of parietal perfusion improved the classification of FTD from AD over structural MRI alone. Additionally, combining frontal and parietal perfusion further improved the classification between FTD and AD. However, the analysis of structural MRI was limited to brain regions that overlapped with ASL-MRI for the comparison. Assessment of MRI data with a larger brain coverage may lead to different results. In addition, compared with the results from reported structural and functional studies,9,20,22,25 classification accuracy of ASL-MRI was not substantially better. The result that frontal volume could not significantly classify between FTD and CN seems counter to previous reports that showed frontal lobe atrophy in FTD.4,5,20 The explanation is that only regions that overlapped between ASL-MRI and structural MRI were included in the comparison of diagnostic values of atrophy and ASL-MRI. Inferior brain regions, including inferior frontal and temporal lobes, which are thought to be strongly impacted by FTD and AD, were not accessible with this implementation of ASL-MRI. With new developments of ASL-MRI technique,40 these interesting regions can potentially be covered by ASL-MRI, and the classification of FTD from normal aging and AD may further improve. Although PET is commonly used for clinical and research imaging studies of dementia, ASL-MRI offers several benefits: It is entirely noninvasive, free of exposure to ionizing radiation, contrast agents, or radioactive isotopes. It can be rapidly repeated within a few seconds after the endogenous labels decay; thus, perfusion images can be completed on most MR scanners in 10 to 15 minutes. An additional benefit is that ASL-MRI and structural MRI can be performed during the same scanning session, providing more convenience for patients. However, current available techniques of ASL-MRI still suffer from low spatial resolution, lack of whole brain coverage and noncontiguous brain slices, low signal-to-noise ratio, and complex data processing. As technical improvements of ASL-MRI are being made, more studies are needed to determine the clinical utility of ASL-MRI. Our study has several limitations. With the current implementation of ASL-MRI, only superior brain regions could be covered, while inferior frontal and medical temporal lobes, which are strongly involved with AD and FTD, were not accessible. PET and SPECT do not have this limitation. Another limitation was that ASL-MRI measurements of perfusion were based on a simple model of water perfusion, in which instantaneous exchange of water from intra- to extravascular space was assumed. In addition, computations of perfusion did not include variable arterial transit times and variations in T1 relaxation of the water labels. To the extent that these factors were systematically different between normal aging, FTD, and AD, the measurements may have over- or underestimated perfusion. An additional limitation was that perfusion measurements were normalized to perfusion of the motor cortex, which may have attenuated perfusion differences in cases where motor cortex was impacted by the disease. Furthermore, we did not account for cerebrovascular disease, which may have contributed to reduced perfusion, especially in older subjects. Finally, these subjects were diagnosed clinically, without autopsy confirmation of the pathologic diagnosis; thus, it is possible that some of patients with FTD and AD had other causes of dementia. As patients with uncertain diagnosis were not included in this study, use of ASL-MRI in a clinical setting, which includes patients with an uncertain diagnosis of dementia, needs to be validated. Supported in part by a research applications grant of the Department of Veterans Affairs REAP, NIH grant AG10897, a Program Project Grant from the National Institute of Aging (PO1AG19724), ADRC (P50-AG023501), and a Network grant from the Hillblom Foundation. Received December 6, 2005. Accepted in final form May 25, 2006. Neary D, Snowden JS, Gustafson L, et al. Frontotemporal lobar degeneration: a consensus on clinical diagnostic criteria. Neurology 1998;51:1546–1554. Siri S, Benaglio I, Frigerio A, Binetti G, Cappa SF. A brief neuropsychological assessment for the differential diagnosis between frontotemporal dementia and Alzheimer’s disease. Eur J Neurol 2001;8:125–132. Rosen HJ, Gorno-Tempini ML, Goldman WP, et al. Patterns of brain atrophy in frontotemporal dementia and semantic dementia. Neurology 2002;58:198–208. Grossman M, McMillan C, Moore P, et al. What’s in a name: voxel-based morphometric analyses of MRI and naming difficulty in Alzheimer’s disease, frontotemporal dementia and corticobasal degeneration. Brain 2004;127:628–649. Kitagaki H, Mori E, Yamaji S, et al. Frontotemporal dementia and Alzheimer disease: evaluation of cortical atrophy with automated hemispheric surface display generated with MR images. Radiology 1998;208:431–439. Gee J, Ding L, Xie Z, Lin M, DeVita C, Grossman M. Alzheimer’s disease and frontotemporal dementia exhibit distinct atrophy–behavior correlates: a computer-assisted imaging study. Acad Radiol 2003;10:1392–1401. Laakso MP, Frisoni GB, Kononen M, et al. Hippocampus and entorhinal cortex in frontotemporal dementia and Alzheimer’s disease: a morphometric MRI study. Biol Psychiatry 2000;47:1056–1063. Frisoni GB, Laakso MP, Beltramello A, et al. Hippocampal and entorhinal cortex atrophy in frontotemporal dementia and Alzheimer’s disease. Neurology 1999;52:91–100. Lipton AM, Benavides R, Hynan LS, et al. Lateralization on neuroimaging does not differentiate frontotemporal lobar degeneration from Alzheimer’s disease. Dement Geriatr Cogn Disord 2004;17:324–327. Kim EJ, Cho SS, Jeong Y, et al. Glucose metabolism in early onset versus late onset Alzheimer’s disease: an SPM analysis of 120 patients. Brain 2005;128:1790–1801. McMurtray AM, Chen AK, Shapira JS, et al. Variations in regional SPECT hypoperfusion and clinical features in frontotemporal dementia. Neurology 2006;66:517–522. Foster NL, Chase TN, Fedio P, Patronas NJ, Brooks RA, Di Chiro G. Alzheimer’s disease: focal cortical changes shown by positron emission tomography. Neurology 1983;33:961–965. Johnson KA, Mueller ST, Walshe TM, English RJ, Holman BL. Cerebral perfusion imaging in Alzheimer’s disease. Use of single photon emission computed tomography and iofetamine hydrochloride I 123. Arch Neurol 1987;44:165–168. Bartenstein P, Minoshima S, Hirsch C, et al. Quantitative assessment of cerebral blood flow in patients with Alzheimer’s disease by SPECT. J Nucl Med 1997;38:1095–1101. Jeong Y, Cho SS, Park JM, et al. 18F-FDG PET findings in frontotemporal dementia: an SPM analysis of 29 patients. J Nucl Med 2005;46:233–239. Ishii K, Sakamoto S, Sasaki M, et al. Cerebral glucose metabolism in patients with frontotemporal dementia. J Nucl Med 1998;39:1875–1878. Grimmer T, Diehl J, Drzezga A, Forstl H, Kurz A. Region-specific decline of cerebral glucose metabolism in patients with frontotemporal dementia: a prospective 18F-FDG-PET study. Dement Geriatr Cogn Disord 2004;18:32–36. Miller BL, Cummings JL, Villanueva-Meyer J. Frontal lobe degeneration: clinical, neuropsychological, and SPECT characteristics. Neurology 1991;41:1374–1382. Varma AR, Adams W, Lloyd JJ, et al. Diagnostic patterns of regional atrophy on MRI and regional cerebral blood flow change on SPECT in young onset patients with Alzheimer’s disease, frontotemporal dementia and vascular dementia. Acta Neurol Scand 2002;105:261–269. Lojkowska W, Ryglewicz D, Jedrzejczak T, et al. SPECT as a diagnostic test in the investigation of dementia. J Neurol Sci 2002;203/204:215–219. Charpentier P, Lavenu I, Defebvre L, et al. Alzheimer’s disease and frontotemporal dementia are differentiated by discriminant analysis applied to (99m)Tc HmPAO SPECT data. J Neurol Neurosurg Psychiatry 2000;69:661–663. Diehl J, Grimmer T, Drzezga A, Riemenschneider M, Forstl H, Kurz A. Cerebral metabolic patterns at early stages of frontotemporal dementia and semantic dementia. A PET study. Neurobiol Aging 2004;25:1051–1056. Julin P, Wahlund LO, Basun H, Persson A, Mare K, Rudberg U. Clinical diagnosis of frontal lobe dementia and Alzheimer’s disease: relation to cerebral perfusion, brain atrophy and electroencephalography. Dementia 1995;6:142–147. Pickut BA, Saerens J, Marien P J, et al. Discriminative use of SPECT in frontal lobe-type dementia versus (senile) dementia of the Alzheimer’s type. J Nucl Med 1997;38:929–934. Varrone A, Pappata S, Caraco C, et al. Voxel-based comparison of rCBF SPET images in frontotemporal dementia and Alzheimer’s disease highlights the involvement of different cortical networks. Eur J Nucl Med Mol Imag 2002;29:1447–1454. Roberts DA, Detre JA, Bolinger L, Insko EK, Leigh JS, Jr. Quantitative magnetic resonance imaging of human brain perfusion at 1.5 T using steady-state inversion of arterial water. Proc Natl Acad Sci USA 1994;91:33–37. Johnson NA, Jahng GH, Weiner MW, et al. Pattern of cerebral hypoperfusion in Alzheimer disease and mild cognitive impairment measured with arterial spin-labeling MR imaging: initial experience. Radiology 2005;234:851–859. Alsop DC, Detre JA, Grossman M. Assessment of cerebral blood flow in Alzheimer’s disease by spin-labeled magnetic resonance imaging. Ann Neurol 2000;47:93–100. Rosen HJ, Narvaez JM, Hallam B, et al. Neuropsychological and functional measures of severity in Alzheimer disease, frontotemporal dementia, and semantic dementia. Alzheimer Dis 2004;18:202–207. Morris JC. The Clinical Dementia Rating (CDR): current version and scoring rules. Neurology 1993;43:2412–2414. Jahng GH, Zhu XP, Matson GB, Weiner MW, Schuff N. Improved perfusion-weighted MRI by a novel double inversion with proximal labeling of both tagged and control acquisitions. Magn Res Med 2003;49:307–314. Jahng GH, Song E, Zhu XP, Matson GB, Weiner MW, Schuff N. Human brain: reliability and reproducibility of pulsed arterial spin-labeling perfusion MR imaging. Radiology 2005;234:909–916. Leenders KL, Perani D, Lammertsma AA, et al. Cerebral blood flow, blood volume and oxygen utilization. Normal values and effect of age. Brain 1990;113:27–47. Ashburner J, Friston KJ. Voxel-based morphometry—the methods. Neuroimage 2000;11:805–821. Good CD, Johnsrude IS, Ashburner J, Henson RN, Friston KJ, Frackowiak RS. A voxel-based morphometric study of ageing in 465 normal adult human brains. Neuroimage 2001;14:21–36. Hirao K, Ohnishi T, Hirata Y, et al. The prediction of rapid conversion to Alzheimer’s disease in mild cognitive impairment using regional cerebral blood flow SPECT. Neuroimage 2005;28:1014–1021. Small GW, Mazziotta JC, Collins MT, et al. Apolipoprotein E type 4 allele and cerebral glucose metabolism in relatives at risk for familial Alzheimer disease. JAMA 1995;273:942–947. Talagala SL, Ye FQ, Ledden PJ, Chesnick S. Whole-brain 3D perfusion MRI at 3.0 T using CASL with a separate labeling coil. Magn Res Med 2004;52:131–140.